Workshop attendees compare unit prices and retail prices at Incollingo’s Market in Penns Grove. The “Cooking Matters at the Store” Program, funded in part through a Catholic Charities grant, educates individuals on how to get the most nutrition and how to stretch their food dollars. 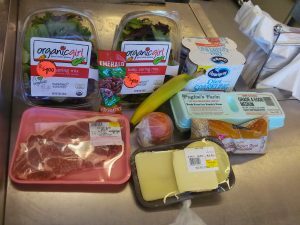 When you’re on a tight budget, it can be a real challenge to shop for food that is not only affordable and healthy but also tasty. 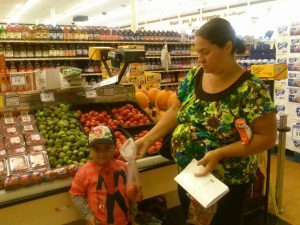 Through the “Cooking Matters at the Store” Program, also known as the “Healthy Food on a Budget Grocery Store Workshop,” Salem County residents are able to learn how to get the most nutrition and stretch for their food dollars. 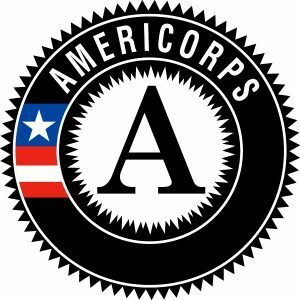 The program is funded in part by a grant from Catholic Charities, Diocese of Camden. One participant’s meal – $10 can go a long way! Workshop topics included the pros and cons of fresh produce vs. frozen or canned products, how to compare unit prices and retail prices, understanding nutrition labels, and how to build a healthy plate by including each food group in one’s daily diet. One of the fun elements of the workshop is an in-store shopping competition in which participants are challenged to put into action what they have learned by trying to purchase healthy foods to make a meal using $10 or less. The most recent workshop was held on Sept. 15 at Incollingo’s Market in Penns Grove, where twice the number of anticipated participants attended, and each attendee completed the $10 shopping challenge under budget. And these savvy shoppers were all able to bring their selected grocery items home with them afterward at no cost. 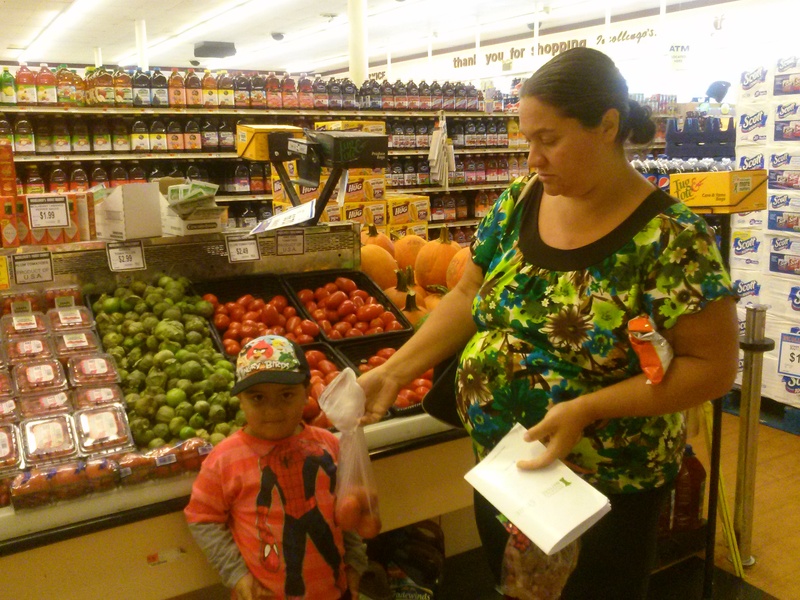 A workshop participant and her son participate in the $10 meal challenge at Incollingo’s Market in Penns Grove. Representatives of Rutgers Cooperative Extension and SNAP-ED program, Alex DelCollo and Nicole Curtis, led the workshop. Curtis asked participants to describe some of their current shopping habits and to share with the group what they hope to change after the workshop session. 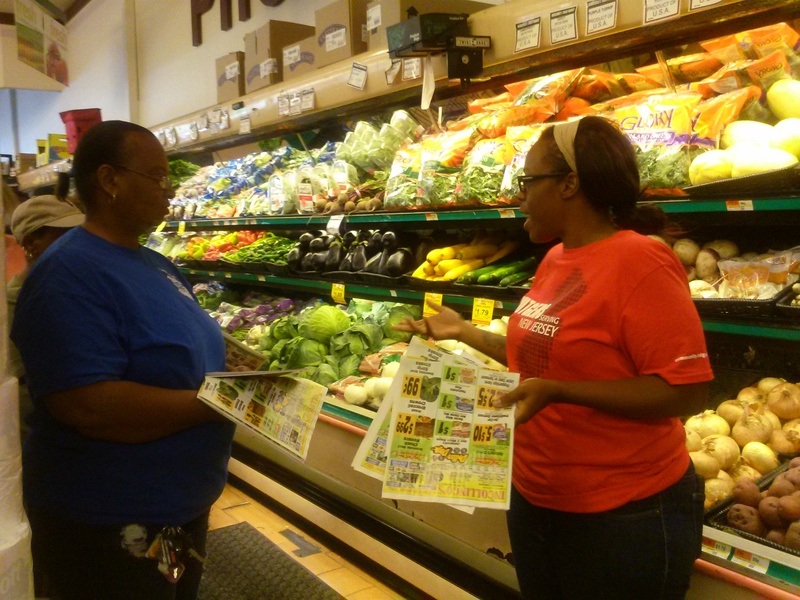 “I want to learn how to get the most of my dollars spent on groceries, but I also want to be aware of healthier food options because of my medical conditions,” explained one participant. Another attendee shared that he only buys what he likes every time, but is willing to try different foods that could be cheaper yet still tasty. By the end of the workshop, participants agreed that they are now less likely to purchase sugary drinks and cereals. They are also less inclined to consume foods with high sodium and high fat content. The next two workshops will be held at Incollingo’s Salem location on Oct. 18 and at its Penns Grove market on Nov. 15. To sign up, call Catholic Charities Salem office at 856-339-4102. Catholic Charities extends its thanks to Ed Incollingo for hosting these workshops in his food stores.